Anyhow, here’s where the little bit of faith comes in. We’ve had some struggles here lately. I’m not ready to discuss it publicly just yet but we’ve been going through a hard time. And in the past when I’ve been presented with a crisis, I’ve found it difficult to be ok, to let myself be ok until things were resolved. It’s true. I want things neat and tidy and then I’ll allow myself to be happy. You are right. It is absolutely ridiculous for a grown woman to behave this way…and yet…I did. Until this time. Because stuff just fell apart and I could not fix it right away. So I cried and sobbed and cried some more until I had no more tears or enough people prayed for me to have enough peace and calm that I finally did. Or a combination of both. So I gathered myself and decided that life had to go on, I had to teach my children to dance in the storms of life. So I made egg roll in a bowl and we watched a good movie and we laughed and I realized we can be ok even when everything is not. And that’s what I’ve been doing every day. Letting life be ok and having a lot of faith that there is a grand plan. Most of all, God knows what He is doing and He can make a way when I cannot see a way. So basically my motto is cook something good and have a little faith. Ha ha!!! This egg roll in a bowl is truly a delight for your tastebuds and you will be so glad you made it. The sight where I found the recipe was http://www.bunsinmyoven.com/2015/08/24/sausage-egg-roll-in-a-bowl/. As Mr. Cook used to say after he made his recipes every afternoon on the KALB news before Days of Our Lives came on…”ooh it’s so good! !” Seriously y’all…it is so good!! Have faith!!! 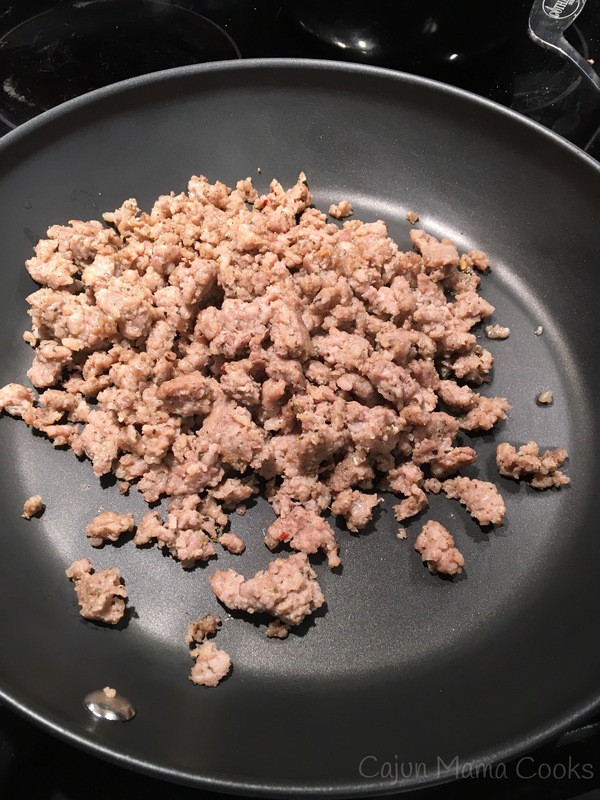 Start by browning the sausage in a skillet. It said do not drain but I did. Oops. It was fine. Set aside. 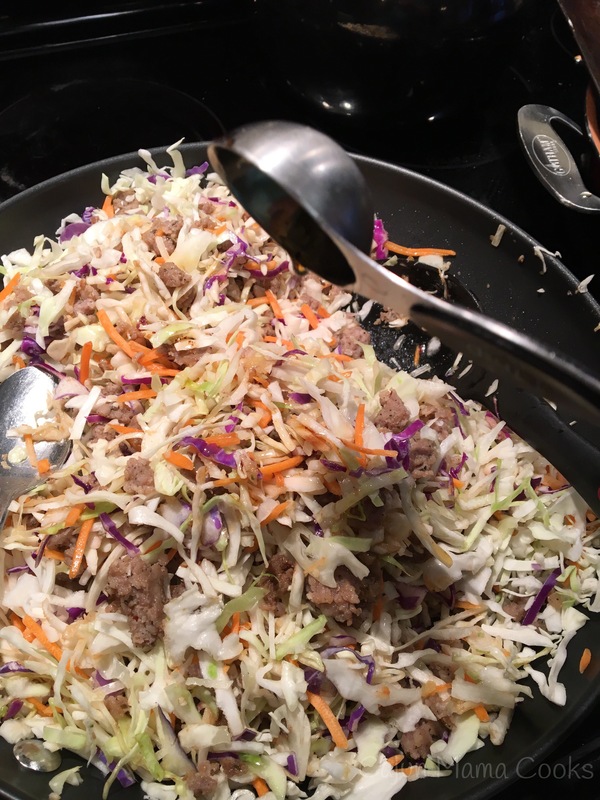 Stir the coleslaw, garlic, ginger and soy sauce into the skillet with the sausage. 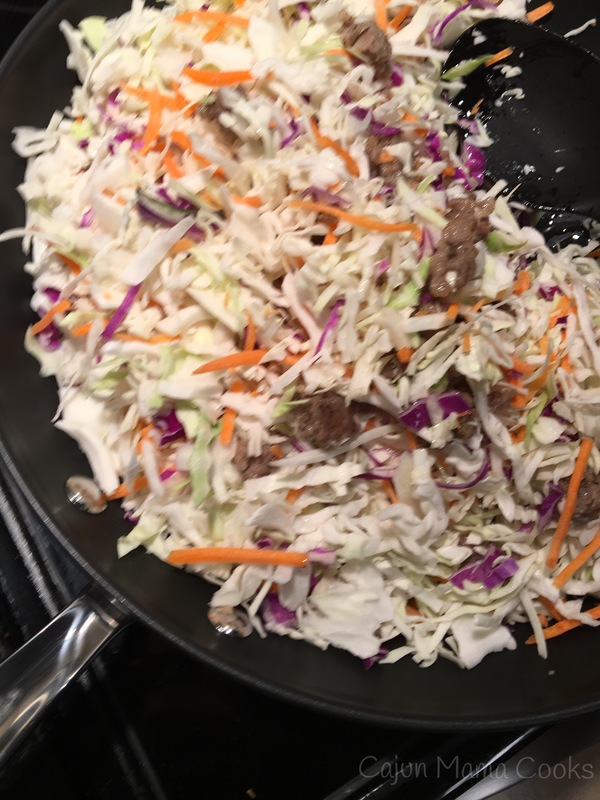 Cook for 3 or 4 minutes or until the coleslaw is slightly tender. Remove from heat. Sprinkle the green onions all over the mixture and then drizzle that sesame oil over it. Just. So. Good. And FYI I am going to be making this once a month at least if not more. It heats up beautifully and tastes even better the next day. Egg roll in a bowl. Tell your friends! !